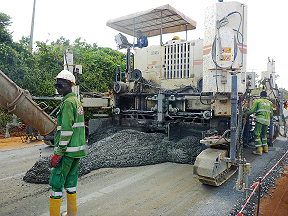 Before the slipform paver, which can pave concrete pavements in widths of up to 6.0 m and thicknesses of up to 400 m as standard, was able to begin work in Itori, the substrate first had to be prepared. The construction company used compacted laterite and a 20-cm layer of crushed rock. “The SP 500 then paved the concrete quickly and cost-efficiently. At the same time, it also helps us ensure that our production quality meets the specifications for surface evenness,” explains Ashif Juma, Managing Director of AG-Dangote Construction Company Limited. The SP 500 laid down the new 7.50 m-wide and 20 cm-thick roadway in two separate passes. Extending over 24 km, the new road is the longest uninterrupted stretch of concrete roadway in Nigeria. To continuously provide the concrete paver with sufficient material, a steady convoy of up to 15 concrete-mixing trucks drove to the job site, depositing their loads directly in front of the machine. However, before concrete can be paved, it must first be produced. The production chain begins with limestone mining. This mineral is one of the raw materials used in cement, which in turn forms the basis of concrete. The Dangote Group extracts limestone from its open-cast mine in Ibese, where the Dangote Cement Company operates 14 Wirtgen surface miners of the type 2500 SM. The Dangote Group not only uses road construction machinery from the Wirtgen Group’s Road Technologies business sector, but also the mining technology offered by its Mineral Technologies sector. 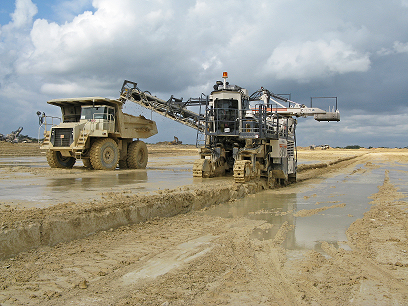 Wirtgen surface miners cut, crush and load the rock in one single operation. The rock is broken down directly during the extraction process into grain sizes that are suitable for belt conveyors, making the use of a crusher superfluous. This saves time and reduces the costs of the entire mining process. Wirtgen had already supported the Dangote Group before operations at the Ibese mine began, not only with the machinery, but also with production process planning and training for the specialists on site. This partnership has now endured for more than 15 years. It therefore stood to reason that AG-Dangote Construction Company Limited would opt to use Wirtgen technology and applications know-how for the road construction project between Itori and Ibese. Precision, flexibility and reliability are the hallmarks of the SP 500. And this also applies to the new generation of slipform payers lined up in Wirtgen’s new SP 60 Series, which comprises the SP 61/SP 61i, SP 62/SP 62i and SP 64/SP 64i models. The SP 60 Series is set to replace the globally successful SP 500 model and, like its predecessor, offers a wide range of options to meet the diverse demands of inset and offset paving – including hydraulic and electrical vibrators, dowel bar inserters, finishing equipment, swivel arms, wireless 3D control, not to mention a variety of offset molds. Work on the 24-km concrete roadway was completed after six months of construction. After completion of the paving work, a concrete cutting machine cut slits at right-angles into the road surface at intervals of 3.65 m so that the resulting joints could be filled with expandable material. These pre-determined breaking points prevent potential tension cracks. “With professional maintenance, this will ensure that the roadway lasts for at least 40 years,” says Juma, explaining the last step of the construction procedure. Thrilled with the successful outcome of the project, the Managing Director also decided to acquire additional concrete equipment from Wirtgen. AG-Dangote Construction Company Limited has expanded its fleet of road construction machines, purchasing two of the last SP 500 pavers produced, along with a TCM 95 texture curing machine. Previous: Is Change as good as a holiday, or as bad as poor user adoption?